Clearly I have gone mad. Completely nuts. 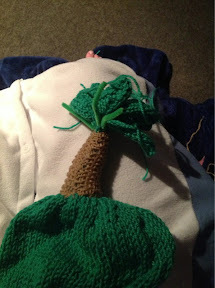 This beanie has a palm tree on top. Why? It’s a long story involving a floating island in a Pantomime. Cast on 80 stitches in green on 4mm needles. K2 together over the whole row. 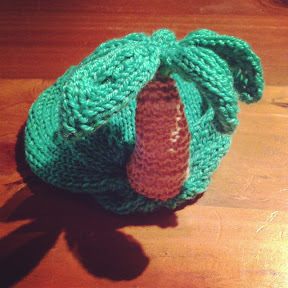 Cut yarn with 30 cm remaining, thread stitches onto cut yarn. Sew up the side with this length of yarn. 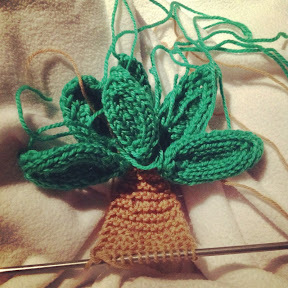 Slide stitches onto the end of the needle, leave until you have 6 leaves. K2 tog over whole row. The sewing up of the tree is a little nuts. Line the inner leaves with pipe cleaners. 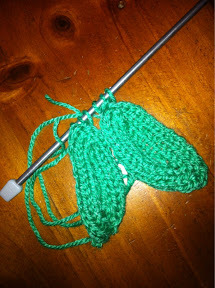 Wrap the pipe cleaner tails with stuffing, tie on with spare yarn. 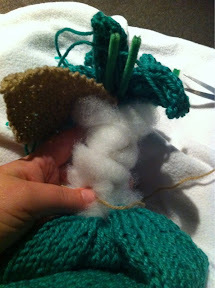 Stitch the trunk around the stuffing. 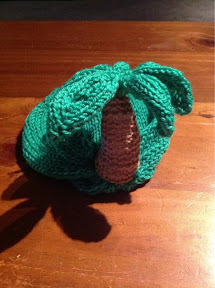 Attach to the top of the hat. 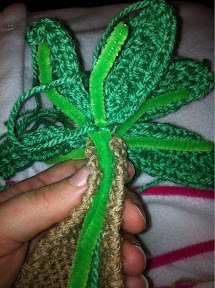 Use the tails to secure the pipe cleaners to the leaves.